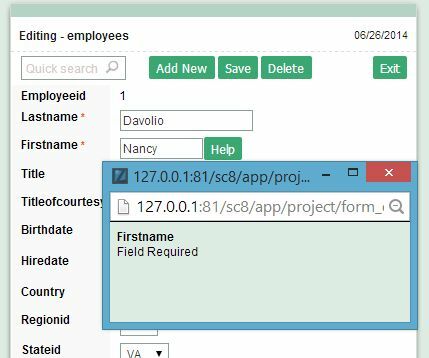 Data type -Define the application field type. Date fields are formatted according to specific date rules. Validation Image - Allows to show an image when validating a field. 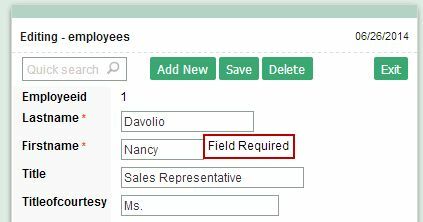 Regional Settings - Allows you to apply regional settings date format to the field. (See regional settings). Display - Allows you to select the display format of the field. Use ComboBox - Allows you to select the date and month by combobox. Year as Combo - Allows you to select the year by combobox. "Initial Year" - Define the minimum year selectable. "Actual Year +" - Define the maximum year selectable. Fixed Date - Insert a minimum date that the scriptcase will criticize in the field of the date type in the format as it is presented. Simple Actual Date - Will define the actual date as the maximum	date, that means, it won't accept anyone in the form who was born	after the corrent date. Actual Date with increment - The minimum date will be the actual	date (+) the days or month or years that you increment. Actual Date with decrement - The minimum date will be the actual date (-) the days or month or years that you decrement. Fixed Date - Insert a maximum date that the scriptcase will criticize in the field of the date type in the format as it is presented. Simple Actual Date - Will define the actual date as the maximum date, that means, it won't accept anyone in the form who was born after the corrent date. Actual Date with increment - The maximum date will be the actual date (+) the days or month or years that you increment. Actual Date with decrement - The maximum date will be the actual date (-) the days or month or years that you decrement. 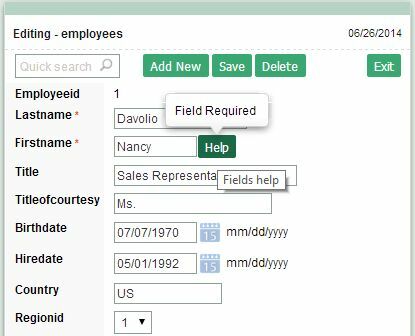 Display Format - Allows you to display next to the field how to complete the date field. Display	Calendar -Allow to show beside the field a calendar icon, this allow the selection	of the month and year passing to the field the value that was defined in the calendar. Years Limit -Defines a limit of years used in the calendar.